As we look forward to a new year, it’s also a wonderful opportunity to reflect on what was an extraordinary 2017 at Niagara Health. We had much to celebrate over the past year. 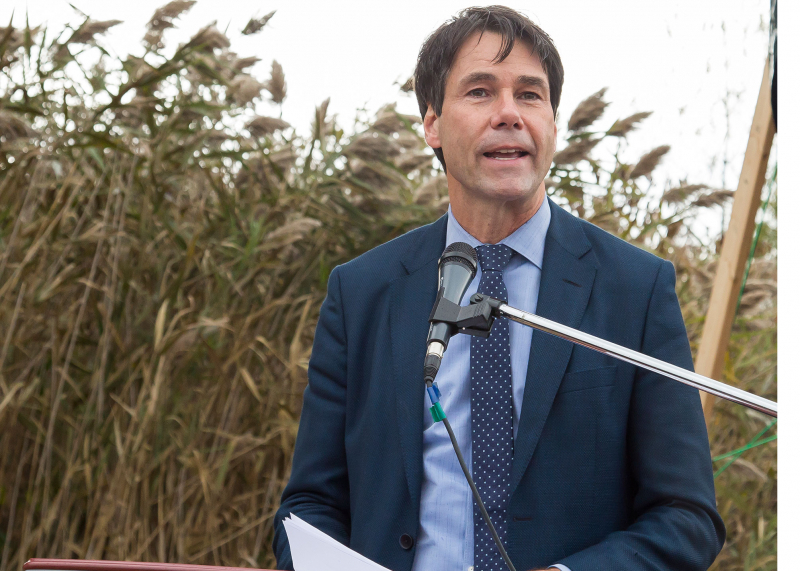 One of our proudest moments came when Dr. Eric Hoskins, Minister of Health and Long-Term Care, visited the location of the new Niagara Health: Niagara Falls Site in October to make a couple of important announcements. Minister Hoskins announced that the construction of the Niagara Falls Site is moving forward. The new site will provide healthcare to Niagara residents through state-of-the-art facilities designed to meet the region's changing healthcare needs. He also announced that the Welland Site will remain open for patients and families in Niagara. The site’s services will be finalized as the planning process for the new hospital moves forward. Healthier Niagara: We’re proud of the progress we are making with our 10-year strategic plan. We continue to see improvements in patient care through the strategic initiatives that we launched in 2016, such as the Integrated Comprehensive Care Program that helps patients who have Congestive Heart Failure and Chronic Obstructive Pulmonary Disease manage their conditions at home. And in 2017 we introduced new initiatives, including more regular patient checks called We Round. We Round is a structured, proactive approach to rounding in which nurses and other members of the healthcare team check on their patients at least every two hours, and ask specific questions related to pain, positioning, possessions, pumps and alarms, and personal needs each time. As well, we introduced more frequent surveys of our staff and physicians, asking them about the quality of their work life and to give everyone a stronger voice to help influence change and support extraordinary teams. In the most recent survey, the Employee Engagement score increased from 62% to 65% and the Physician Engagement score increased from 61% to 73%. You can learn more about our strategic plan initiatives and follow our progress here. Dedicated teams: There have been many additional pressures on the healthcare system over the past year, and our teams have demonstrated tremendous compassion and teamwork while proving high-quality care for our patients and families. New procedure in Niagara: Our surgical teams started performing Endovascular Aneurysm Repair procedures at our St. Catharines Site. The introduction of this innovative procedure to Niagara is another example of care closer to home for residents in the region. Patient Safety Award: Our Venous Thromboembolism (VTE) Program was recognized with the Excellence in Patient Safety Award by the Canadian College of Health Leaders. The program focuses on improving VTE daily risk assessment processes for every admitted patient, and starting preventative treatment if needed. Top performer: The Canadian Institute for Health Information’s Your Health System report showed that we are a top performer in the country in a number of areas, including conducting fewer low-risk caesarean sections compared with the national average; readmissions to hospital for all patient types (medical, surgical, obstetrical and pediatrics); percentage of residents whose condition did not worsen related to assistance with walking and other movement, and the number of long-term care residents whose mood from symptoms of depression worsened. Giving ways: Our teams demonstrated their giving ways throughout the year, coming together to support such worthy causes as the Big Move Cancer Ride, the Rankin Cancer Run and the United Way. Our Foundation rebranded to Niagara Health Foundation. The new name and new look reflects the Foundation’s partnership with Niagara Health and the Foundation’s commitment to helping build a healthier Niagara. Acts of Kindness: Our Acts of Kindness Workplace Challenge is spreading across our organization. The idea for the challenge was originally generated by our Information and Communications Technology team after the launch of our workplace Be Kind Campaign. The department came up with the idea of performing 1,000 acts of kindness to encourage our culture of kindness and connect the team to care. Since then, nine departments have participated in the challenge, completing more than 8,000 acts of kindness. Innovation on display: Throughout the year, our work and research was presented by our teams to other healthcare leaders at conferences across Canada and beyond. For example, several of our initiatives were featured at the Ontario Hospital Association HealthAchieve Conference in Toronto: The Anterior Hip Early Ambulation and Discharge Program; Never Events for Hospital Care Safety Initiative and a quality improvement initiative focused on patients who are malnourished when they are admitted to hospital. New website: We launched our new website to make it easier for users to find information and connect with us at Niagara Health. Feedback provided from within our organization and across our communities helped to inform the design, content and overall look and feel of the new website. Financial health: Our financial health continues to improve thanks to the work of our Niagara Health team. 2017 marked the fourth straight year we’ve had an operating budget surplus to reinvest. Recruitment efforts: We continue to have great success in retaining and recruiting the best and brightest to work at our sites across Niagara. Improving patient experiences: We were one of 15 healthcare organizations in North America to be named a recipient of The Beryl Institute’s Patient Experience Grant and Scholar Program. The Beryl Institute is supporting the work of our Walker Family Cancer Centre team, which is focused on improving the overall patient experience by collecting first-person narratives from patients and their healthcare providers. We also kicked off our in-person survey to check in on our patient experiences in the moment in order to make improvements on the spot. Brock University honour: Brock University Faculty of Applied Health Sciences honoured Niagara Health at its annual Community Partners Reception for our contributions, leadership and dedication to experiential learning and research. We have more than 1,900 students from many academic partners now every year to share the learning all in the name of a healthier Niagara.